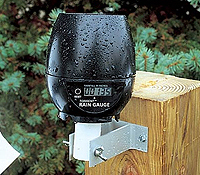 Rain gauges tend not to be the most technical of devices. However, this latest one ads a bit more geeky-ness to your garden. The Digital Rain Gauge has been created and it’s wireless too (but not in a wi-fi type of way). What it allows you to do is track the rain which is then displayed on a small LCD screen which can be read up to 10 feet away. The only reason it gets the “wireless” added to it’s name is due to it being powered by an AA battery. Surely it should have been named a “Battery Powered Digital Rain Gauge”. Not to worry! The digital rain gauge is designed for farmers who need to know how much rain there has been so they can best look after their crops. Accuracy of the gauge can see it measure to within 1000th of an inch which is not too shabby at all. The rain gauge also does not collect and store the water. The rain water just merely passes through the device and the amount of water is measured by counting as the rain falls through it. Resetting the device can be done at the touch of a button. The digital rain gauge costs $60.